you are my God! Hour by hour I place my days in your hands. I have a friend who throws pots. Her web site describes her as a ceramic artist and indeed that is her true vocation, an exquisite handler of clay. Nevertheless, she has taught me through the years a great deal about pot throwing and the robust yet fragile nature of her medium. When pot throwing was her focus she would sit at her turning wheel and taking a hunk of clay determinedly throw it directly into its center. There it lay, until she placed her wet hands around its shapelessness. Gently pressing, with the wheel continuing to turn, a graceful shape would begin. I was impressed. Then I began to follow this graceful shape through the days of drying, glazing and firing that would ultimately bring out its true beauty. When it finally emerged from the fire I was humbled. Careful thought and consideration had been given to each step of its creation–nothing had just happened. There were a few unknowns as to the end result, nevertheless, the raw graceful shape was painstakingly prepared for the final process that would bring out its character and depth of color–fire. When you feel the hit and turn of life’s wheel, lie still for a bit. Soon the Potter will begin gentling pressing. It will be uncomfortable and perhaps a lengthy process, but be assured, nothing is just happening. 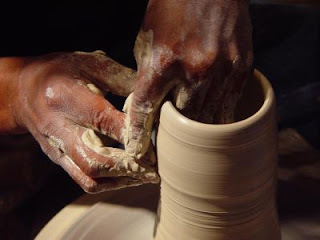 It’s the time spent in His hands, along with some fire, that will ultimately bring out the character and color of you–God’s exquisite work of art. I will become Your exquisite work of art.